She was ten. Her tiny little girl legs dangled from the kitchen chair, occasionally kicking me under her mom’s Formica table. She rested her elbows on the table, a spoon in one hand and the other hovering over her Lucky Charms. She picked out the Marshmallows and popped them into the air so she could catch them in her mouth. She was twelve. We swam together on the swim team. Her body was rounding through the belly and she was already taller than the rest of us. Despite her changing body she was the quickest swimmer. And the quickest to make me laugh. She swirled around me in the cool blue water, her blonde curls bobbing, her head falling back when she laughed. She dripped with sarcasm, bundled in her towel, licking her fingers and dipping them into a box of dry lime jell-o, waiting for our next event. We swam the relay together. We passed the time wagging our green tongues talking about the boys we thought were cute and what we would wear on the first day of school. She was sixteen. Mom told me she had seen her out jogging along Gravelly Lake Drive. Mom said she had lost weight, that she wasn’t a chubby little girl anymore, that she looked great. She was seventeen. Her sister and I worked together at The Taco Shop. Her sister told me that she dominated the track team and set new records for Cross Country. Her sister said that she was training for the Olympics and making their mother quite proud. Her sister also confided to me that their was concern about how thin she was getting. She was twenty. Mom told me she had heard that she was sent away to a clinic because she wasn’t gaining weight. She said she saw her out running along Gravelly Lake Drive and she had looked like a ghost. She couldn’t believe those little legs were able to carry her frail frame. She was twenty-three. I saw her for a moment. She was walking behind her mother in a crowd. My boyfriend squeezed my leg under the table and raised his eyes towards the sickly figure. I didn’t recognize her. She wasn’t smiling. She looked 100 years old with her skin caved in around her cheeks. She looked tired. Her skin was pale, her once bouncy blond curls were thinning and pulled back in a small pony tail. She didn’t see me. She didn’t see my look of horror and sadness. She just walked by quietly with her head lowered. It was only an instant. She was twenty-nine. It was in passing that Mom mentioned she had died. She would have been thirty. I try not to comment on the way my friends look, their weight or their appearance. Not when they look good, not when they look thin. I try to tell them how happy I am to see them. I try to get them away, from the clubs and the gym and the pressured existence of Manhattan ambition. I try to laugh at their jokes, tell them how funny they are, engage their souls, connect. I don’t allow the gym clothes to hide the reality that my friend is becoming too thin. So thin that I need to reinforce through my actions that boys, and party dresses and the pursuit of glamour, adoration and the thinnes reserved for the naturally petite is not what will make us feel full. I try not to read those magazines. I try not to stand in front of the mirror too long. I am thirty-three. When I pass by the news stand on the corner of 14th and 6th Ave, I see the little girls in their knee high socks on their way to school, standing on their tippy toes to catch a glimpse of the fashion magazines behind the counter. 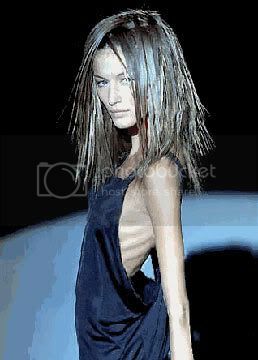 I see the glossy covers brandishing Hollywood starlets “dying to be thin”. I see their tiny wrists. I see their thinning hair. I see their sunken cheeks and protruding clavicles. I see her tiny, little girl legs, dangling off the chair in her mother’s kitchen.